Four men have been convicted of planning a major terror attack in Birmingham after being caught in an elaborate undercover operation. The trial of Naweed Ali, Khobaib Hussain, Mohibur Rahman and Tahir Aziz at the Old Bailey has been one of the strangest - and most vigorously contested - terrorism cases of the past decade. Friday 26 August 2016 was supposed to be just another day at the office. Vincent was the boss of Hero Couriers in Birmingham. The firm delivered delayed luggage. Its website boasted it was "working with" major airlines. Only it wasn't. The entire firm - everything about it - was fake. Its manager was really an undercover officer deployed by West Midlands Police's Special Projects Team. Hero Couriers' real business was catching jihadis. On this particular Friday, Vincent was waiting for his MI5 colleagues to arrive to bug a suspect's car. But the MI5 officers carrying out the banal-sounding "technical operation" found weapons inside the car belonging to Naweed Ali: A handgun, pipe bomb and large cleaver carved with the word "kafir" - unbeliever. At the beginning of 2016, Ali had come on to the radar of the West Midlands Counter Terrorism Unit, a combined team of specialist detectives and counterparts from MI5. Ali and Khobaib Hussain were next-door neighbours in the Sparkhill area of the city. But they were already well known to investigators. The pair had previously been jailed for going to an al-Qaeda training camp in Pakistan and there was intelligence their mindset had not changed. They were once more "subjects of interest". Behind the large red doors of Hero Couriers' office in the city centre, Vincent and his colleagues were keeping an eye on them. Hero Couriers had been in operation for up to four years. It had all the trappings of a real courier firm - vans, a corporate logo and a supposed headquarters in Hilton Hall, a stately home converted to offices, near Wolverhampton. But it was all bogus. The firm had no customers - it did no real deliveries. It existed only in order to watch suspects. "Let us rise to be your Hero!" the website said. "Recruiting now!" That was the hook that ensnared the would-be jihadists. Khobaib Hussain and Naweed Ali were looking for casual work. If they were duped into working for Hero, the police and MI5 would have access to their vehicles, which could then be bugged. Hussain was the first to take the bait. The 25-year-old was paid £100 for each of nine days' work: Four trips to Manchester, three trips to London and two trips to Luton. Ali, the next to be recruited, turned up for his first day on 26 August 2016. Vincent convinced the 29-year-old to leave his car inside the depot while he embarked on a trip to Luton. While he was out, MI5 was to bug the car. Except, they were running late - and Vincent wasn't happy. "Leaving in 5 m8... they're fannyin about," texted "Andy", the undercover officer driving in the MI5 team. "Tell me about it!!!!" said Andy. When the MI5 team arrived, the trial heard, it was to insert an audio probe into the car and then search it if there was time. No-one was expecting evidence of a crime at this point, but officers found a multi-coloured shopping bag, from the JD Sports chain, stuffed under the driver's seat. As they opened it, they saw a large meat cleaver, a gun, shotgun cartridges and an improvised explosive device (IED) made out of pipe capped at both ends. "I will admit to being scared and it took some time to pull myself together and fall back on the training I had received," one of the anonymous MI5 officers told the trial from behind a curtain. The MI5 team evacuated but Vincent was left on his own with the weapons, waiting for the Army bomb-disposal squad to arrive. Ali eventually returned to the Florence Street lock-up at 11:25. As he parked, a detective arrested him on suspicion of terrorism. Ali said nothing. Within hours Khobaib Hussain was in custody. So were two other men, Mohibur Rahman and Tahir Aziz, both from Stoke. When Aziz was arrested, police found a large samurai-style sword placed down the side of the driver's seat of his car. Meanwhile, the Army bomb-disposal squad was at Florence Street - and despite the scare, it was beginning to look like a job well done. "Absolute top-drawer job from you and the team today. Great stuff. Just left briefing and everyone chuffed. Hope you enjoy a well-deserved beer over the weekend… Yeeeeees boys class." When other officers heard how Vincent had stayed with the pipe bomb after MI5 withdrew for their own safety, and how Andy had helped him move the weapons, the "herograms" flew around in text messages. All of these were disclosed at the trial. "You've closed half of the city centre down mate - carnage ! :)" exclaimed one. "Haha and not a bead of sweat off u either. Cool as! What a team Vincent seriously :))" said another. "This is unbelievable!" said one MI5 officer. "Could have saved hundreds of lives. So chuffed. "I'll be stealing none of the credit mate - imagine what those [expletive] could have done with that stuff. Beers on me when we're back." "If my camera worked I would send you a picture of two empty bottles of wine … :)" said Vincent to Andy. The gun turned out to be a replica - but the pipe bomb was real enough, albeit not primed for detonation. A scan revealed it contained gunpowder and that there was a shotgun cartridge at each end. Had the device been completed, it would have been capable of causing an explosion. All four suspects were charged with preparation of an act of terrorism - punishable by a life sentence. All but one of the men were already familiar with the justice system. Back in 2011, Ali and Hussain had secretly left their Birmingham homes to join an al-Qaeda training camp somewhere in Pakistan's mountains. Their dreams of becoming mujahedeen heroes became an unmitigated disaster. As their mobile batteries and network reception began to fade at the miserable camp in the mountains, they called their mums. Al-Muhajiroun: Was this the most dangerous group in Britain? Their shocked and furious families found a relative in Pakistan to track down the men and bundle them on to a flight home. When they arrived, they went straight into West Midlands Police's cells. Ali and Hussain were later convicted of preparing for acts of terrorism. But when the pair got out in 2013, they had not changed. While in HMP Belmarsh, in south-east London, one of the most secure prisons in the country, they met Mohibur Rahman. He had been jailed for possessing material useful for terrorism, having been an associate of bungling bomb plotters with an incompetent plan to blow up the London Stock Exchange. Rahman would later introduce his new Birmingham friends to the fourth defendant in the Hero Couriers trial, Tahir Aziz. While he had no previous convictions, Aziz was part of the Stoke end of the banned al-Muhajiroun network - the group run by the hate preacher Anjem Choudary. Ali returned to jail twice for breaching his release licence's ban on him associating with other men deemed to be a security risk. He was finally out for good in March 2015 - and the Security Service was watching. By late spring of 2016, investigators had concluded that Ali, Hussain and Rahman needed to be prioritised. Their behaviour was odd and bore the hallmarks of men trying to avoid surveillance. On 26 May last year, Hussain met Rahman and Ali and all three went to a popular dessert cafe in the heart of Small Heath, one of Birmingham's busy Muslim areas. All three men were seen to turn off their phones and put them away. On another occasion, Hussain was observed putting his phone down under a tree some distance away from where he was sitting and talking. In early August the three core suspects gathered in Birmingham. Again, as they went out on a boating lake, they put their phones away. Rahman told the trial that since 2015 he had on-off contact with an MI5 officer called "Rob" who had made a number of attempts to recruit him as an informant. He said the Security Service was interested in Ali and Hussain and he was handed £200 in cash as an inducement to work for them. Ali himself had also been separately approached, without success. Rahman claimed that the repeated putting-away of phones was because he wanted to discuss this "harassment" with his friends. The prosecution argued this was nonsense. It was a move to prevent investigators discovering what the men were really talking about - the genesis of an attack plan that, the trial heard, was apparent from their social media. The jury heard how time and again the men had shared content about violence across the Muslim world and hatred towards the West. They praised men who had supposedly laid down their lives for Allah on foreign battlefields. Naweed Ali posted hate messages about Jews and Christians. The day after the July 2016 deadly lorry attack on a crowd in the French city of Nice, Hussain urged others to be prepared for "fully-fledged war with Europe". Aziz, who had so far not featured in the alleged planning meetings, was posting his own comments about how undercover police should "burn in hellfire". At times, the conspirators joked about their inadequate skills. Ali was likened to one of the useless extremist characters from the film Four Lions, a grim satire on jihadist terrorism. Hussain, meanwhile, told Rahman how far he would go for him. "I will take a bullet for you in the tickle tackle bro lol." Then on 11 August, Hussain messaged Ali and instructed him to "Make new group… me u n Mohib only". The encrypted chat on the Telegram app was called The Three Musketeers Group, complete with a cartoon of the characters from the 1993 Disney film. The talk among the Musketeers turned more serious. They spoke about visions of heaven, and also the idea of washing away their guilt at having done little while others made "sacrifices". 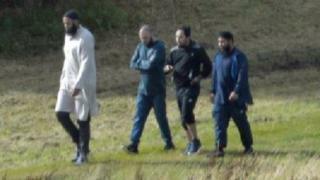 In mid-August last year, the three agreed on an overnight trip to Rahman's home in Stoke. He messaged the two other Musketeers to tell them not to bring their phones, but to use pay-as-you-go handsets bought on eBay. Hussain messaged Ali, suggesting they move to "encryption mode". Asked at trial why, he said it was to discuss their train tickets. Both men had cars, which were left at home. Once in Stoke, they made a call to Tahir Aziz after 01:00. The defendants said at trial it was to cancel a meeting to view his fridge. The prosecution said it was a late-night decision to include him in the plan - and make arrangements to meet the following day. Shortly afterwards, the evidence showed the Musketeers searching the web for a documentary on the foiled 2006 plot to bring down airliners with liquid bombs. The following day, all four men met in a park - but they were now being closely followed. Ali repeatedly looked around and dropped back, as if trying to spot the surveillance team. A single message from Rahman to the others, three days later - and two days before the arrest - summed up their collective state of mind, prosecutors said. "I feel so guilty," he told his fellow conspirators. "I can't even make a sacrifice as little as my PS4 [games console]." He shared a clip with his friends of an extremist preacher talking about the "humiliation" of not waging jihad. "What are we doing, akhi [brother]? Sitting here, working, and that's it," he added. "Nothing happening - we just talk. We gotta do something." Nobody other than the defendants knows what happened next. According to the prosecution, at some point in the last days of August 2016, the choice of weapons was finalised, but probably not the target. Aziz put a sword in his car in Stoke, and Ali stashed the bag of weapons in his car in Birmingham. But nobody saw them do it. In fact, no surveillance officer ever saw the multi-coloured JD Sports bag that held the weapons. Detectives found CCTV footage of Hussain going into the sports shop - but not coming out with that particular bag. Throughout the trial, Naweed Ali's defence counsel, Stephen Kamlish QC, focused on what he said was a crucial gap in evidence connecting the defendants with the weapons. And he said if there was nothing to link the men to the weapons, it was abundantly clear what had happened - the defendants had been fitted up. Vincent allegedly had ample time to plant the evidence in the car at Hero Couriers - and plenty of time after the arrests to cook his notes. Mr Kamlish repeatedly told the jury the officer's logbook appeared to have been written in a single go from one pen. Andy, who had retired between the end of the operation and the trial, messaged words of support to Vincent. "You have power over your mind - not outside events," he texted. "Realise this and you will find strength. Marcus Aurelius." Vincent replied: "Marcus A… would have fed these [expletive] to the lions tho mate." He spent almost two weeks giving evidence, an astonishing length of time. It was repeatedly interrupted as Mr Kamlish demanded more disclosure of Vincent's background and communications with others. He became increasingly irate at the accusations that he was corrupt. But when it came to the crunch, Naweed Ali declined to go into the witness box and give evidence in his own defence. And there was a crucial piece of evidence. Inside the weapons bag was a roll of tape which had been used to attach a magazine to the replica gun. That tape was sent for a second DNA analysis during the trial and the forensic scientists found a partial match to Khobaib Hussain and another match to his sister. The roll of tape, said the prosecution, must have come from Hussain's home. The evidence was clear, they told the jury, that Hussain had played a key part in assembling the weapons. He had been on a pipe-fitting course and knew how to cap the device found in the car. This plot, known within the police as Operation Pesage, was one of the 18 would-be attacks foiled in the past four years. Like many of the others, it involved a tight-knit group of friends who were egging each other on to pick up some pretty basic weapons and see what they could do. But it took a very sophisticated operation, involving an undercover fake business and advanced DNA matching, for a jury to be convinced that Naweed Ali and his friends were not just men messing about but jihadists capable of causing real harm on the streets of Britain.